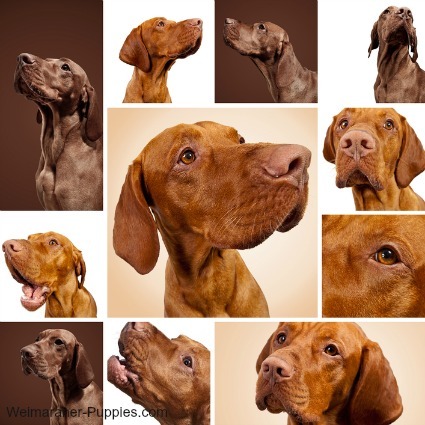 Vizsla dogs share a number of characteristics with Weimaraners. Vizslas are hunting dogs, energetic, athletic, protective of their families, gentle with children, and they can be quite headstrong. 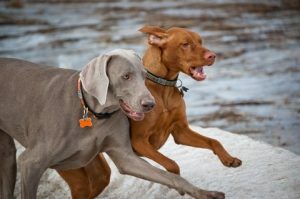 While the Vizsla and the Weimaraner have different colorings, they are often confused with each other. In fact, some people think the breed is named Vizsla Weimaraner! 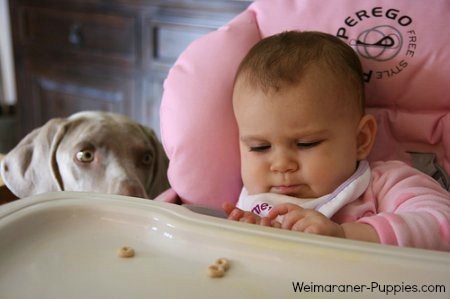 Weinheimers or Weimaraners originated in Germany, and the Vizsla orginated in Hungary. They are also known as Hungarian Short-haired Pointers, Rovidszoru Magyar Vizsla, Hungarian Pointer or Magyar Vizsla. Vizsla dogs have some characteristics of the Weimaraner. What Do Vizslas Look Like? Vizslas look very much like Weimaraner dogs, but they do have some differences. Coat – Vizslas have golden rust tones while Weimaraners tend to have gray or brown tones in their coats. Some Vizslas do have small white spots on the fore chest, tail and the neck. The Vizsla’s hair is short. Grooming – They shed their hair, but it is seasonal. According to the American Kennel Club, a Vizsla is self-cleaning dog. They do not need to be bathed very often and do not develop a typical “doggy odor”. However, if they spend a good deal of time in lakes or streams, they can get a weak “wet dog smell” and might require a quick bath. 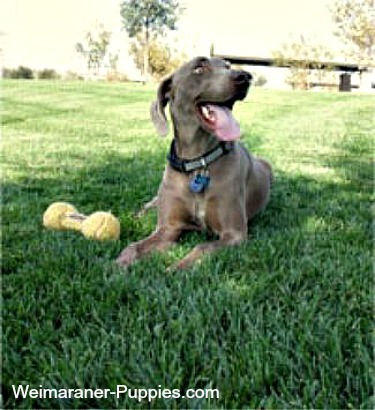 Weimaraners and Vizslas make great companions, and they have much in common. Height – Vizslas are smaller than Weimaraners (but still pretty big). The male averages 22-24″ and the female 21-23″. Weight – Males weigh 55-60 pounds and females weigh 44-55 pounds. Trainability – easy. Vizslas are eager to please. Vizslas are hunting dogs. They were bred to be hunters, and they are strong, athletic dogs. Excellent swimmers, Vizslas might need a little encouragement to get used to the water, at first. As such, they can make great duck dogs. Natural instincts give this dog excellent retrieving instincts, both on land and in water. They are great pointers and excellent retrievers. Vizslas do need to be trained with care. They must be trained gently, without physical punishment or harsh words. Sensitive and intelligent, they learn well with a training system like this one. Even though they are active, energetic dogs, they are great with children. And they can be trained to be wonderful watch dogs, protecting family members. Vizslas adore their owners. They are affectionate and loyal. Are Vizsla Dogs a Good Match for You? 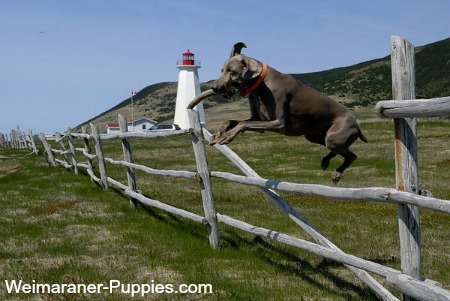 While Vizsla dogs do not look exactly like Weimaraners, they do have a number of things in common with Weims. Both are high energy dogs, and, if you love to be active, you would do well with either dog breed. Vizslas love attention and they love to be active. Intelligent, they need mental stimulation, and they will get bored if left alone for too long a time. When this happens, they can get into trouble, developing destructive behaviors. If you live in an apartment, a Vizsla is not your best choice. They need to be taken on daily long walks or jogs. If you go bike riding or roller blading, a Vizsla would love to jog along beside you.